Line drawing is the beginner artist's best friend. Once you understand that any subject can be created with simple strokes, suddenly the possibilities become endless! A contour drawing is established by tracing around the outside of a subject. 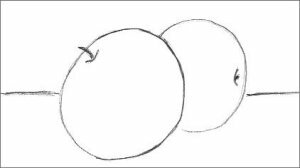 For example, to create a contour of 2 apples, you go around the edge of the whole block and not the two individual forms - see the example below. An artist seeks the combination and not detached figures. 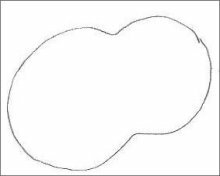 The outline is not a part of the object or background, but an imaginary line sensed by the eye. Contrast can be represented by a line varying in intensity or even width. I always tell my granddaughter than she can be good at anything providing she devotes time to practice. When you have a fierce desire to draw, practice isn't a chore, it's a chance to achieve a goal. Line art drawing is a wonderful way to teach yourself to see forms properly. It involves going around the outlines of various subjects with a simple pen or pencil. Line drawing differs to contour because each object is defined. My images here are left in rough form to show you how I keep going around shapes until I find the right lines. Drawing or sketching lightly is an interesting assignment. This is something that I neglected to do initially so please make sure you include it on your to-do list. Never erase but instead keep going over strokes until you eventually find the outline that you envisage - these images have great spirit and are very attractive. The eraser is just not required for this type of study. 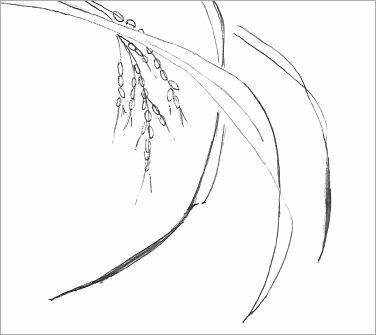 All kinds of practice ultimately teaches you to draw freehand and to depend on your eyes. Use every trick at your disposal to overcome being self-critical. I don't know why we torture ourselves and become discouraged so easily but it does happen to a good majority of us. Learn to accept every piece you create and take the time to acknowledge your personal achievements. Everybody starts at the beginning! 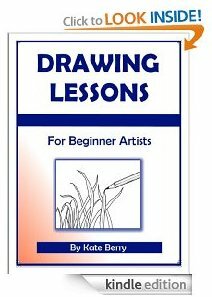 Drawing Lessons are great for getting your hand to move in rhythm with your eyes and to gain flexibility you didn't know you were capable of achieving. The exercises build up your confidence with a gradual progression from easy onwards. Each progression gives you the confidence to move forward and experiment. 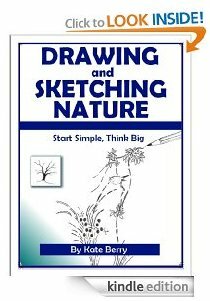 Drawing and Sketching Nature is my favorite because Nature is the best teacher you can find - she shows you how to understand perception along with tricky subjects like foreshortening and perspective. I just had to share this simple way of learning with you! I hear the Kindle Reader is not available in all countries so I'm very sorry if you are unable to share this experience due to your location. If you struggle to initiate a drawing, then my other book called How to Draw Outlines might very well be the answer to your problem. It shows you 9 different ways to achieve an outline and all you have to do is decide on the one that suits you the best. Update: I created a book filled with my favorite shortcuts and called it Drawing Tips for Beginners. This is the exact type of book I always searched for so if you want to learn new ways to get faster results, I hope it serves you well. There is a lot of stress in day to day life but if we create a pocket of time to draw, we can retreat there to rejuvenate ourselves. It's a very healthy hobby! Drawing helps you remain on an even keel and it really does enhance your ability to cope. I don't want you to take my word for it though, I want you to prove it to yourself. See the simple illustration below that can be conjured up in mere seconds. 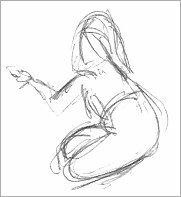 Gesture drawing is also a line drawing where you continuously feel for the right line by going over and over existing ones. Apparently there are rules for gesture drawing but I'm not big on setting or following rules in art. We each know what feels right and that is why I encourage you to find your own rules to make you the master of your pencil. Mentally prepare to sketch rapidly. Find the main line of direction from top to bottom. This action gets you going, you've made a start and you can use that stroke as the center of the subject. Start adding all the shapes that you see around it. Be as fast as you can manage. Feel free to make appropriate marks along the length of the line so you know the subject will fit. It is hard to complete a whole subject in 30 seconds so don't fret about that, acknowledge it and move on to the next one. The images here show a couple of my early attempts that I'd really rather hide but if it helps you somehow, I am happy. Don't be afraid to go over lines to find the true form. Eventually, your pencil will concede and find the correct lines. It may take a while but you soon dictate who is boss in this experiment. 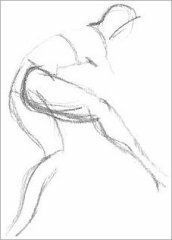 Gesture incorporates energy and movement so it's a great way to help you understand the human form. You also learn to judge shapes and become more accurate with intial placement of lines. 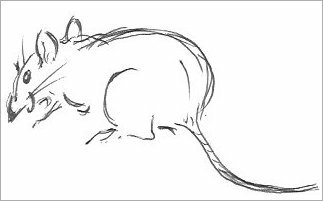 The scribbled images are meant to be completed in a very short amount of time - either 30 seconds or one minute. Scary, I know, but I still practice it constantly, to get up to speed and be comfortable with the process. This type of line drawing teaches you proportion, construction and movement, without the distraction of detail. There is no need to indicate things like fingers or toes, you want only the flow of line, rhythm and unity. Rhythm is lost when you go searching for detail. Understanding shapes is a large part of being able to complete a good illustration so line drawing is one way of helping you get to that place. See yourself emerge as the artist you always wanted to be. You can certainly expect your first results to be ugly. Keep trying and quietly accept the awkward shapes that first emerge. You may feel as though they are taunting you and more or less telling you that you can't draw but you must push through this barrier! Your persistance will definitely pay off and true images start emerging effortlessly. The triumph you feel is worth the whole experience. 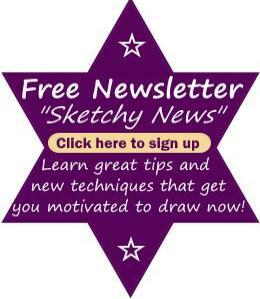 If you don't have time to draw, then scribble! Scribble and line drawing are very good mates. Play with lines, find out what happens when you drag them this way or that. Scribbling takes you from a beginning and leads you toward an end. Something is better than nothing, right? Everything I know about drawing has been built around a simple line. You didn't take a sure and steady step when you first started to walk so it just makes good sense to start this hobby with line drawing. When you learn gradually like this, you absorb everything more easily. I wish you every success.